The Interchurch Center, a massive, 19-storey building at 475 Riverside Drive on the Upper West Side of Manhattan, serves as a "a center for Protestant and Orthodox communions in America" and calls itself "a visible symbol of the oneness of many churches in Christ." 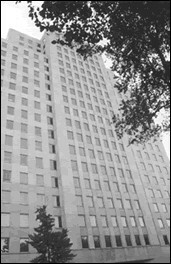 The building has an illustrious and establishmentarian history, having been funded in part by the Rockefellers, given a mortgage by the New York Life Insurance Company, and had its cornerstone laid by President Dwight D. Eisenhower. The center opened for business in 1960 with what it calls "a moving ceremony that marked the official opening of a new chapter in the movement for a greater unity among the churches of the United States." That was then. This very month, The Interchurch Center unanimously passed a mission statement that asserts its goal to be providing "a working environment that is conducive to ecumenism and interreligious involvement." To do so, it will draw on Christian traditions of hospitality that "promote a sense of community and respect for diverse religious views." Well, when they say "diverse religious views," they really mean it, for the center hosts in suite 246 the New York office of the country's leading militant Islamic organization – the Council on American-Islamic Relations. Interestingly, the CAIR-NY website provides The Interchurch Center's street address but makes no mention of its name.